2018 - June 12. Company CEO Suzie Wright at the Gold Coast Business Excellence award presentation night. 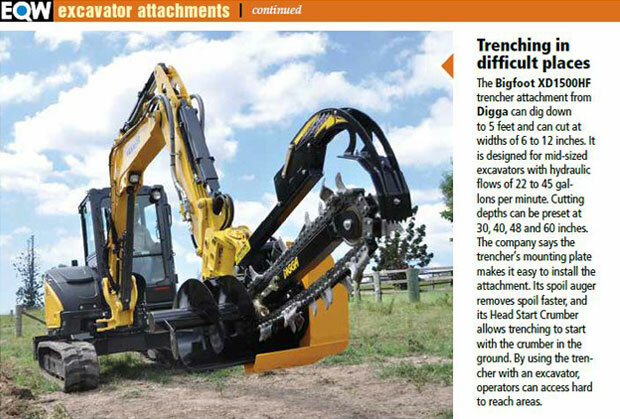 Digga North America recently featured in Equipment World magazine with our Bigfoot Trencher XD. Available for skid steer loaders, excavators and backhoe loaders the Bigfoot Trencher XD is our most powerful trenching attachment. It has a digging depth of up to 60 inches and when fitted with our tungsten carbide teeth, this trencher has proven it can cut through an asphalt road – perfect if you have to lay pipe lines or cables. To view the full range of Digga trenchers click here.